Sustainability has been a part of the Boy Scouts of America’s DNA since the Conservation merit badge was introduced in 1911. In the century-plus since, the BSA, which relies on green spaces for its life-changing experiences, has been a leader in keeping those green spaces around for future generations. That’s why this week in West Virginia, Scouts, Venturers, volunteers and professionals are meeting with corporate leaders and environmental experts to discuss all things sustainability. The candid, nothing’s-off-limits conversation will reveal best practices, discuss sustainability challenges facing the BSA and explore potential solutions. But I haven’t told you the best part. This isn’t some closed-door meeting. Sessions will be streamed live online at greentodeepgreen.org. That means you can participate by watching, chatting and tweeting during the event. You can watch the Sustainability Summit at this link. I’ve included the full schedule and six must-see moments below. You can chat along while you watch the Sustainability Summit at this link. Sustainability Summit organizers will be monitoring the chat conversation and fielding questions from those watching remotely. If you’re joining the conversation on Twitter, you’ll want to include the hashtag #SustainableBSA with your tweets. That will ensure your comments are seen by participants at the event and those watching along at home. Sustainability Summit organizers will watch for your questions and comments on Twitter, as well, and respond live whenever appropriate. Not free to watch the livestream, um, live? Want to rewatch certain parts with your Scouts, perhaps while teaching Sustainability merit badge? There’s good news. Everything will be available for replay viewing. As you can see in the full livestream schedule at the end of this post, the three-day event is packed full of incredible sessions. Each and every session is worth your time. But I wanted to point out some of the must-see moments I’ll be tuning in for. 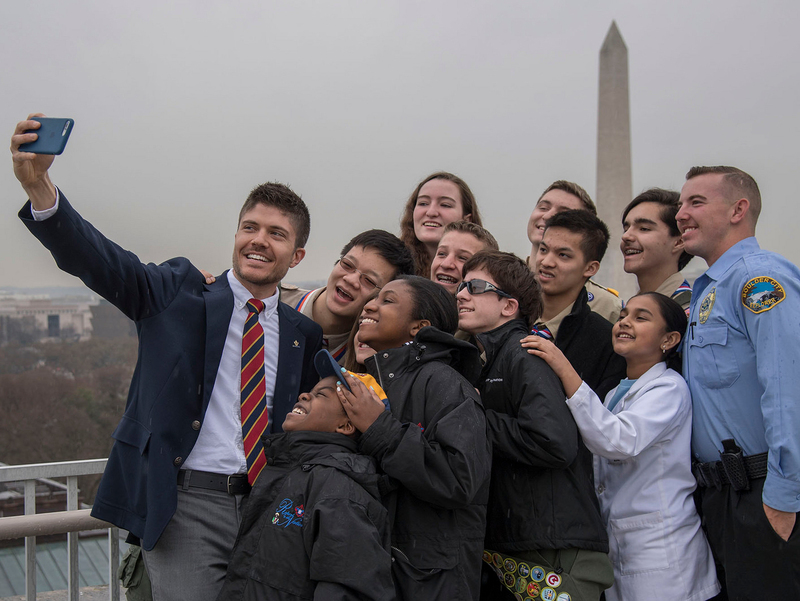 They include the release of the BSA’s first-ever Sustainability Report, talks with Eagle Scouts who visited Antarctica and the Ecuadorian Amazon, and a conversation about the ways in which faith and sustainability can coexist. You won’t want to miss any session, but these six stood out to me. With each one, remember to watch, chat and tweet.